Disclaimer: The under listed items are items and foods that i (and some people around me) have used and they worked. I am not a doctor, so feel free to try them at your own discretion. I recommend you consult your doctor or nutritionist before you attempt them, just in case you need more clarification or in doubt. Hi there, in the past I wrote about belly fat and what the causes are, you can still read that here. Now that we have identified the cause, lets follow up with how to tackle it. Lemons: This is my all time favorite fruit. Ever since i discovered lemons, the smell, the taste, wow! 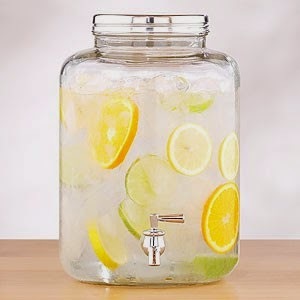 Use lemons in your morning water. Mix a table spoon with warm water in the morning, drink a glass 30 mins before breakfast. Do it for one week and see results instanta! 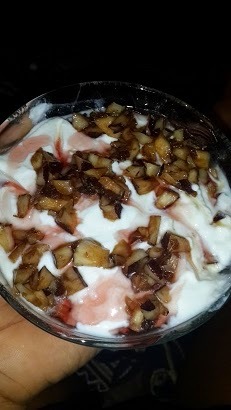 Yogurt: Anyone that follows me on my bbm, or my food blog, will know how much i love yogurt. I hardly run out of yogurt. Its so good that i use it for my hair treatment nowadays. Yogurt contains probiotics that feeds our intestines with good bacteria. Good bacteria helps get rid of toxins in the body. My Yogurt and berry Mess. 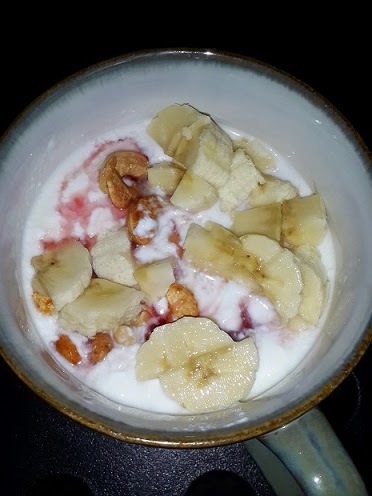 My Yogurt and nut Mess. 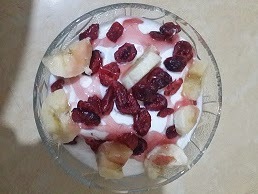 My Yogurt and coconut Mess. Oranges and limes: These are a great source of vitamin C. They help to reduce the cortisol levels in the body. Cortisol is a stress hormone. It helps the stomach to break down food fast, relax the stomach and fight gas/bloating. Have an orange 5 mins before a meal to help you eat less. Nuts: Ehen! some g.nut lovers will be smiling at this. Dis na Some people dem dia poison. Lol. A hand full of nuts is great for you. Have it as your mid day snack with 2 glasses of water, my dear you will feel full for hours to come. It will make you eat less on your next plate. I prefer mixed nuts. Try almonds, cashews and peanuts. Fish: Have you ever gone a month without chicken or fish? If not, now is the time to challenge yourself. If you really need to flatten that mid section, then eat just fish with some meals for a whole 30 days. Start today. Fish like Salmon and Mackerel contain Omega 3 fatty acids which help reduce inflammation in the body. When the body is inflamed, its very difficult to lose weight. Signs of inflammation in the body: Itchy ears and eyes, bloating, diarrhea, joint pains, dark circles under the eyes, coughing, stuffy nose, sinus, acne, rashes, compulsive eating, cravings, fatigue, constipation.......the list goes on. Do you identify with any of this? If you have at least 5 of these symptoms, you need to detox fast! Avocados: Add this to your breakie, or eat as a mid day snack every time you get the chance. Its great for the stomach and skin. Oats: Low in calorie, and it makes a good healthy breakfast. Full of fiber and helps your digestion. Cocoa. This is another long time love of mine. 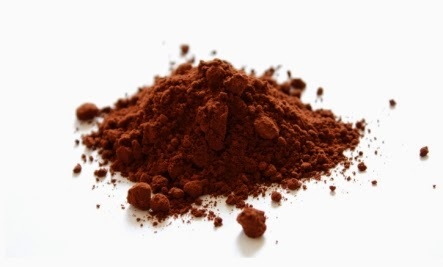 I always have a tin of pure cocoa powder at home. Its really bitter but i add it to my coffee and smoothies. It has loads of benefits. Multivitamins/Swedish bitters: I always recommend multivitamins because i have experienced the benefits first hand, they provide one with the much needed nutrients which we aren't able to meet up with daily. Swedish bitters is another secret weapon of mine. Mix a tsp with your lemon water if you may, it helps the body to produce digestive enzymes that help to break down food fast. WATER!! : Up to 3 liters a day is recommended. 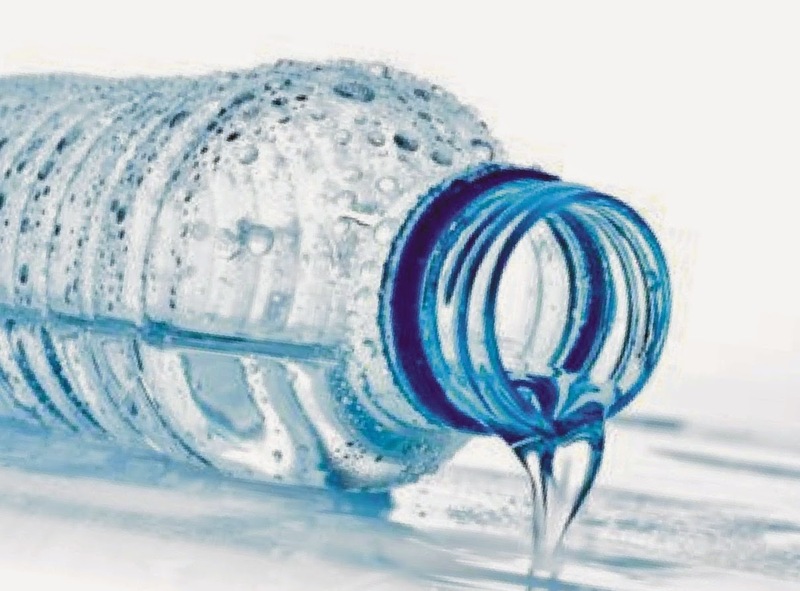 If you workout a lot, make it 4 liters to replace all the water you lost through sweat so as to prevent dehydration. The more water you drink, the flatter the belly will be. Detox: According to google.com a detox is: a process or period of time in which one abstains from or rids the body of toxic or unhealthy substances; detoxification. This is the first step to that flat tummy. If you don't rid the body of these toxins, it will be very difficult to burn fat. I recommend you do this every 3 to 4 weeks. Exercise: Exercises like cardio, crunches, squats all help to flatten and tighten the tummy. High carbs: Resist high carb foods. You really cant keep eating the things you eat normally and expect to lose weight. Something has to give. White bread, pastries, sugar, soda, etc has to go. Replace them with healthier options like whole wheat bread, brown rice, whole meal crackers, fresh juices etc. WATER!!! Lol! I cant stop screaming this because its very very important for that healthy body. Remember the saying "Abs are made in the kitchen?" The general rule is 70% food 30% exercise. You have to organize yourself when it comes to what you eat, if you really want the belly fat to dissolve. You don't have to try all these at once, take them one by one and see what works for you. All the best sweet and God bless. Hi Lady Zee, For how long will you use the body wraps? Once you get it off, its back to square 1. Yes, sit ups and crunches will help a whole lot but you need to watch what you eat. It looks like you are either doing the wrong exercises for that part of the body, or you haven't fully controlled what you eat. like i said in the post, if you don't control what you eat, and you keep exercising, its all a big waste of time. Why not try the detox first then see how it goes. cheers. Btw i'm thinking 4kg dumbbells are too heavy for you at this stage. You will only be overworking your muscles without much results. Try 2kg to 3kg bells. Lol. Ur right Titi, it smells funny. Try mixing a tbsp of it with a glass of warm water and a tbsp of honey to sweeten it. Let me know how it goes. Cheers. No dear, I buy pure unsweetened yogurt. Not the fatty ones. I jazz it up with fruits and nuts how I like and its mostly a meal for me. I have been on this yogurt for months so i am sure, lol. Portion control is key to it. You are kinna right @ not eating late, I thot so before till I experimented. u know some pple get home really late from work? Lets be realistic, they have to eat right? So I wud say, eat a very dainty portion of food, drink about 2 glasses of water before going to bed. Another scenario is when you ate say by 5pm, then off to the gym, after workout, u may eat 1 banana, drink 2 glasses of water then wait some time before going to bed. For those that have the time, its ideal to eat your last meal 3 hrs before your bed time. Cheers. Good morning, I checked the market and they don't sell the apple cider vinegar, please where do I get it? Try medplus or any big drug store. U'll find it there. Thanks. Can you detox while breastfeeding, won't it go to ur breast milk? No dear, you cant detox while nursing. Pls wait till you wean baby. You can do reduced calorie meals though. Thanks Dee. Another question, I would like to know if some of these food do not reduce fertility as I would still like to have another child. Not that i kniw of, but it's always best to talk to your doctor before you begin any programme. Thanks Sweet momma.